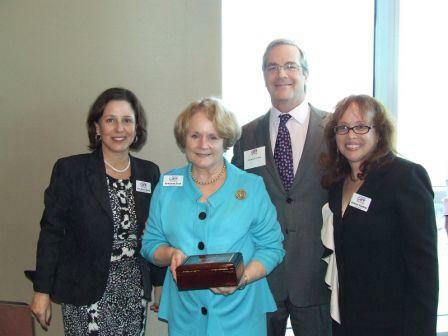 May 09, 2011 – Katherine W. Ezell, a partner at Miami-based trial and appellate law firm Podhurst Orseck, has been recognized by Foster Care Review of Miami, Inc. (“Foster Care Review”) with its Douglas M. Halsey Award for Community Service. The award was presented to Ezell for her years of dedication and service to the organization, as well as her extensive commitment to advocacy on behalf of children and youth in foster care. Foster Care Review is a nonprofit, volunteer-driven organization that exists to help the Juvenile Court provide oversight for the welfare of over 2,400 Miami-Dade children and youth who have been removed from their homes because of abuse, abandonment or neglect. The organization works with the courts to monitor the community care provided foster children to ensure that their basic needs are met, e.g., necessary health care, stable schooling, safe homes and the ultimate goal of permanency. A devoted child advocate, Kathy is the immediate past president of Foster Care Review and has served as a volunteer attorney for Miami’s Guardian Ad Litem Program and Lawyers for Children America, where she has represented guardians, parents, and children in foster care dependency cases. She has received numerous awards for her efforts, including the Tobias Simon Award, the highest honor bestowed annually by the Florida Supreme Court, and the Dade County Bar Association’s Richard C. Milstein Award for Excellence in the area of Public Interest Law. Kathy has served as a member of the Judicial Nominating Commission for the Eleventh Judicial Circuit and for the Florida Supreme Court. She is a former member of the Florida Governor’s Commission on the Status of Women. She is a member of the Miami Dade Justice Association, the Florida Justice Association, the Florida Association of Women Lawyers, the Cuban American Bar Association, the American Justice Association and the American Bar Association of which she is also a Fellow. She is AV rated by Martindale Hubbell.